Yin yang fried riceor Yuan Yang Fried Rice (鴛鴦炒飯) is a rice dish from Hong Kong. The name "Yuan Yang", which refers to mandarin ducks, is a symbol of conjugal love in Chinese culture, as the birds usually appear in pairs and the male and female look very different. This same connotation of a "pair" of two unlike items is used to name this rice. 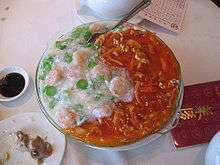 Due to the meaning of love, this dish is often appeared in the wedding dinner. ↑ "久違港式古祖炒飯 (Chinese)". AD Internet Limited. Retrieved 24 August 2016. ↑ "Yuanyang exhibition showcases the contemporary ceramic art" (Press release). Leisure and Cultural Services Department. 2003-02-11.